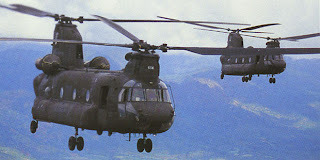 Salman Pak, Iraq – THE STEADY BEAT OF the helicopters’ dual rotors could be heard long before the CH-47 ‘Chinooks’ came into view, flying low over the concrete barriers that made up the perimeter of Combat Outpost (COP) Cleary, southeast of Baghdad. The choppers, resembling a pair of flying buses, glowed ghostly green in the soldiers’ night vision goggles (NVGs) as they touched down on the COP’s landing zone (LZ) and lowered their ramps to accept passengers. Three platoons of soldiers (about 150 men) from the 3rd Infantry Division’s Alpha Company 1-15 (call sign: ‘Hard Rock’) quickly made their way to the rear of the two aircraft, ignoring the bits of gravel and of glass that were kicked into the air and blown forcefully outward by the helicopters’ massive rotor blades. Following the repeatedly rehearsed plan, the soldiers quickly filed in order into the back of the ‘birds,’ sitting on the vinyl-bottomed benches that lined the sides of the helicopters. As the last man boarded each Chinook, the tailgunners strapped themselves in on their helicopters’ respective rear ramps, and the two-ship flight lifted quickly into the air and sped away into the night. For Alpha Company 1-15, Operation Marne Huskey had begun. A DIVISION-SIZED OFFENSIVE operation focused both on hammering insurgents in the area and on stepping up the interdiction of weapons and fighters bound for Baghdad from the region, Operation Marne Huskey – named in part after the 3rd ID, whose nickname is the ‘Marne’ Division and who owns the battlespace south of Baghdad where the operation is currently ongoing – is an integral part of Operation Phantom Strike, a massive coalition effort to hunt down and to torment insurgents in the weeks leading up to General Petraeus’s mid-September testimony before Congress. Phantom Strike not only seeks to blunt the force of any insurgent attempts at headline-grabbing attacks during this sensitive period, but also takes the fight to known and suspected terrorists on their turf, pounding them with aviation- and artillery-borne firepower, as well as stepping up the activities of ground troops in the Diyala and Baghdad areas. With Operation Marne Huskey, 3 ID is relying on human intelligence as a primary determinant of target selection and prioritization. Painstakingly cultivated trust and relationships are paying off in the form of numerous tips from citizens in the region, which are primarily acted on by military aviation assets. Between attack helicopters and sustained ‘air assault’ missions, in which infantry soldiers arrive at (and depart from) the fight in transport helicopters – allowing for much greater range and flexibility in much less time – the aviation-led operation involves a great deal of coordination, and utilizes a variety of effective firepower. THE PAIR OF CHINOOK helicopters sped through the night, completely blacked-out, their pilots and gunners flying and surveying the terrain ahead and behind through NVGs. The assault force’s destination, southeast of Salman Pak, was an area bordered on the south, west, and east by a large bend in the Tigris River, giving it a bowl-shaped appearance on a map. The location, primarily sparsely-populated farmland, was thought to be a base for al Qaeda in Iraq (AQI) activity in the area, including, reportedly, VBIED (‘Vehicle-Borne Improvised Explosive Device,’ or car bomb) factories. After landing at the designated LZ and dismounting from the helicopters, Alpha Co.’s mission was to move on foot to a series of a dozen farmhouses, both to check for insurgents and to search for evidence of VBIED factories. Even more important than these objectives, though, was the blow that such a mission (the first of a series of them throughout the month-long Marne Huskey) should cause to the morale of the AQI in the area who, due to the terrain and the lack of coalition forces in the Salman Pak area (until this year’s ‘Surge’), had been largely untouched there for quite some time. Close to midnight local time, as the flight passed over the Tigris for the second time (though the objective was to the south of COP Cleary, the Chinooks took a circuitous route, passing over the Tigris once to the east, and then coming back across from the south), the rear tailgunners called out “One minute!,” a message that was passed along from man to man until it had reached the front of the bird. Sixty seconds later, the helicopters dropped into place on the LZ, their ramps dropped, and Alpha Co. rushed off the back of their transports and into the heart of al Qaeda country. The platoons split up, each heading for their own pre-designated target houses. The soldiers made their way across the field that made up the LZ with great caution, as, though it had appeared smooth on the satellite photographs used in planning the mission, the field was made up of furrows that changed the elevation by three feet up or down every foot or so, making the terrain extremely rough – not to mention occasionally dangerous, as irrigation ditches seemed to appear without warning, causing several of the soldiers to emerge from the LZ with soaking wet legs and feet. Communicating by radio and seeing via NVGs, the squads that made up Alpha Co.’s three platoons moved from house to house, across more fields and through cow pastures and seemingly impenetrable orchards (one of which was made up at least in part by lime trees). Though no weapons were found at the first few houses, an important discovery was made: a pocket of Shi’a families, living and farming in what was thought to have been an exclusively Sunni area. None looked very happy to see American soldiers walking into their house well after midnight, but the inconvenience was the least of the people’s worries; as Shi’a, they were already under threat of death from al Qaeda in the area (one man said neither he nor his family had left their farmhouse for months out of fear), and if word got around that they had been visited by the Americans – let alone helped them – then their lives would be in even greater danger. For this reason, the houses were searched as quickly as possible, ‘tip cards’ were given out (with the request that the people call with any information on insurgents in the area), and the patrol moved on before their presence inside any individual houses became too noticeable. Out of the first eleven houses – all Shi’a – only one detainee was taken in for further questioning (he had had two different identification cards on his person, each of which listed him as having a different name and birthplace), and no evidence of complicity with any militant group was found. The twelfth and final house – which had been abandoned, and which appeared to represent the limit of that small Shi’a area – yielded the discovery of a decent-sized terrorist weapons cache. Two platoons had checked the house and grounds and moved on toward the designated helicopter pickup zone (PZ) by the time that ‘White’ Platoon arrived there, around 3:45am local time. However, despite being less than half an hour from their exfiltration time, the platoon stopped to look around, paying extra attention to an area just outside the woodline in the house’s yard, where what appeared to be freshly-filled holes had been dug. Using their metal detectors and digging with collapsible shovels, the platoon made quite a find: buried one on top of the other were several large tank and artillery rounds. Further, they also discovered what looked to be supplies for manufacturing explosively formed penetrators (EFPs), as well as a great deal of already-fired machine gun ammunition. The Explosive Ordnance Disposal (EOD) personnel with the unit gathered the weapons, photographed them, and rigged them with charges. As the rest of the platoon moved out, EOD lit the fuse on the explosives laid around the weapons, then moved out themselves, joining the rest of Alpha Co. in moving toward the PZ. After wading across a waist-deep canal and then fighting more muddy, striated terrain, the Company took up a position on the south side of a field to await the return of the Chinook helicopters. As they waited, a message rippled down the ranks: “Controlled det (detonation) in two minutes!” Sure enough, two minutes later a huge explosion rocked the area, and a fireball rose above the treeline off to the soldiers’ right; the tank and artillery rounds rigged with plastic explosive had provided quite a show. As the smoke from the weapons detonation dissipated, the familiar sound of helicopter rotors became audible, first faint in the distance, then growing louder, as the two giant transports appeared over the treeline and made their landing on the PZ. Cold water and mud were kicked up onto the soldiers as they made their way to the rear of their respective helicopters. They quickly boarded, and the two Chinooks lifted off of the ground and sped away into the night, headed back to COP Cleary. With that, 1-15 Infantry’s first mission of Operation Marne Huskey was over, and not a shot had been fired. Though no VBIED factory was found, and the majority of the people on Alpha Co.’s objective were Shi’a, rather than the expected Sunni, the information gained on this mission can be used to the coalition’s advantage. A better understanding of this previously foreign area has been gained, and potential sources of human intelligence have been acquired. The people in this small enclave, who fear for their lives from al Qaeda, now know that the coalition can and will visit their area, as well – something which has to serve as a source of some hope, as they review their options and decide how best to proceed in the future. Operation Marne Huskey consists of dozens of such missions, all driven by intelligence and all aiming both to capture and kill the enemy, and to build new information sources and allies in areas that have not seen a great deal of coalition presence in recent years. Both of these objectives are vital to coalition progress and success in Iraq, and both are being accomplished, one mission at a time, by the troops both in the air and on the ground in the area. Jeff Emanuel, a special operations military veteran, is a columnist and a director of conservative weblog RedState.com. He is currently embedded with the US military on the front lines in Iraq. I just wanted to mention that 3rd ID is the "Rock of the Marne". Beyond that, good article.